This package contains our favourite amber jars and bottles and is ideal also for fermenting! The jars and bottles are made of amber glass: it's not painted or tinted like many of the cheap Asian versions. The best thing about amber glass is that it protects the jar contents from UV light so it makes it the ideal glass for storing foods, particularly UV sensitive ones like fermented foods and drinks and coffee and tea. Ever wonder why beer comes in brown bottles? It helps protect the precious contents from degradation via light. The EZ bottles come with a Grolsch style swing top lid and they are perfect for kombucha or home brew of any type or just to save your home made sauces and cordials. 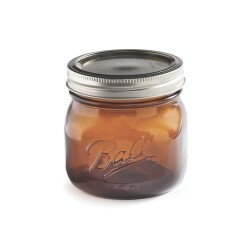 The Ball amber pint jars are a great size for either storage or preserved foods, sealed either via waterbath or pressure canner. Just be aware that the glass is pretty dark so you will definitely need to label the jars as you won't be able to divine the contents by just looking! We have also included a spare set of replacement lids. This package includes FREE shipping to all areas of Australia and New Zealand. Note that the kit cannot be changed and has been maximised for shipping in a single carton. If you wish to order additional items, please place a separate order which will include shipping.